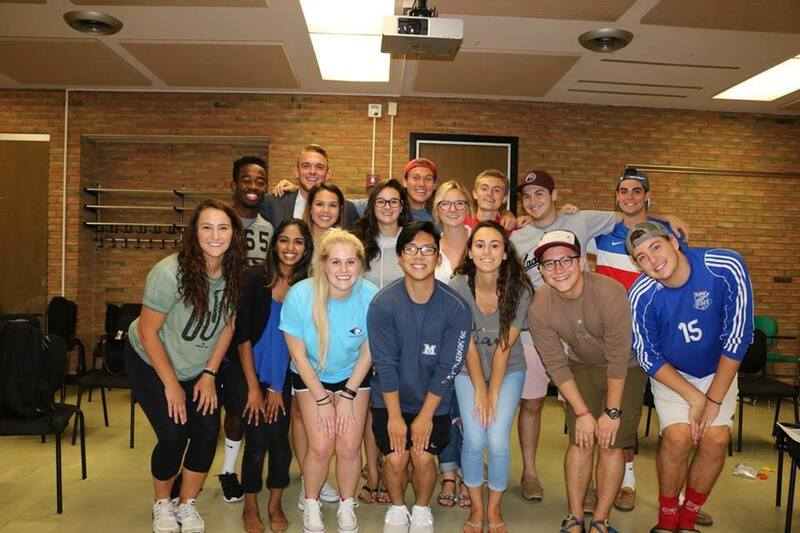 Just Duet is the premiere coed a cappella group at Miami University located in Oxford, OH. As a relatively young group, the group has wasted no time in making a name for themselves with appearances at ICCA as well as a formal invitation from Deke Sharon to perform at Carnegie Hall. We were able to catch up with Jack Garvey, Marketing Director of Just Duet, to learn about the group's history, everyday life, and what's on the horizon for this group. COLLEGE ACA: Tell me about the group's founding. When did the group begin and are there any specific influences you can point to that inspired the group's style? Just Duet: Our group became completely student run in May of 2013! We were known as the Miami Mergers up till then. The Mergers were motivated by the opportunity to open up auditions to the whole student body, which gave way to the formation of Just Duet! CA: How would you describe Just Duets sound? Do you all have a particular genre focus? Has the group diverted from the original sound the group started out with? JD: I would describe Just Duet's sound as "emotional." We do vary our genre, but our best sounding songs (in my opinion) are slower songs that allow for build and large dynamic changes. I personally wasn't in the group when we transitioned, but according to the remaining members, our sound really developed the first semester of 2014. CA: How does Juet Duet fit into not only campus life but the overall Oxford music scene? JD: We are one of 5 student run a cappella groups on campus, and the only co-ed group! In terms of fitting into the music scene, we get opportunities throughout the Oxford community including performing at on-campus and off-campus events, at the local nursing home, and the local elementary school just to name a few opportunities! CA: Currently, what are the top 3 shows that the group is streaming on Netflix? JD: Bob's Burgers, Stranger Things, and It's Always Sunny in Philadelphia. Our group also has an odd fascination with the Bee movie! CA: What are some of the activities the group likes to get involved in when they aren't rehearsing or performing? What do you all do for fun? JD: One of the things that make us a unique group is that we have people in every different aspect of campus involvement. We have members in Greek Life, numerous professional fraternities, fashion clubs, and countless others! In terms of fun, we just enjoy spending time with each other! We have a few members that live with each other off campus, so we're all together almost every weekend! I can't think of a closer group of people. CA: So, according to your Facebook page, you all just completed your Fall Auditions. How was the overall process? Stressful? Easy-going? Do you all have a set way you structure it each year? JD: Our auditions went really well! We added 6 new members this year and couldn't be more pumped! Our process is extremely effective in making sure we get the best members possible. We hold general auditions one day, and call back a certain amount of auditionees based on our needs. We always try to take the best of the best, and we did that this year. CA: Do you have any crazy/funny/interesting stories from group road trips, performances, rehearsals, etc.? JD: Our most fun/funny/interesting trip we've taken was without a doubt out to New York over last spring break! Our group was invited by Deke Sharron to perform at Carnegie Hall! The experience was absolutely incredible. We got to participate in numerous workshops and met a ton of different people from across the country! CA: So, Just Duet released an original song, which is slowly becoming more of a thing in the collegiate space. Can you tell me a little about the song? JD: Our original song was written and composed by graduated senior Lia Knapp. She was really the only one that worked on it, but she really did a fantastic job in making it exactly as she wanted it to sound. CA: What one song does most of the group love, but would never, ever perform during a live performance? JD: Our group is super into Bob's Burgers, so maybe any song from that show! CA: Anything else you'd like for our audience to know about the group? Any big plans for the coming school year? JD: Our group is actually recording our first professionally mastered album this coming winter break! So be on the lookout for that! Other than that, Just Duet is just a really fun group. I personally did not sing at all in High School and came in with no singing experience. The group immediately welcomed me with open arms and I really found my family on campus. Be sure to check out Just Duet on their website, Facebook, Twitter & YouTube pages. Also, see the group's first original song "Relapse" in the below video.